After all, He Who Must Not Be Named did great things. Terrible! Yes. But great. (SPOILERS) If you want a functional, serviceable, unremarkable version of Harry Potter, look no further than Chris Columbus’ chocolate-box, Hollywood-anglophile vision. It’s studiously inoffensive and almost entirely lifeless. I should emphasise at the outset that I’m not a Harry Potter fan; I don’t have anything particularly against the series, but by and large it failed to captivate me on screen, so I’ve had little impetus to reach out for the novels. However, I was curious to revisit each film successively, having seen them exactly once. Columbus’ offerings are much as I remembered, striking dutiful, overly diligent notes in faithfulness to the author – and fans – but missing out on being anything much more than that, and it’s easy to see, on this evidence, why JK Rowling’s first choice, Terry Gilliam, demurred at the prospect of being tied to someone else’s rule book. Of course, that doesn’t mean there isn’t in-between ground to be eked out; it’s surely no coincidence that the series’ best entry is also its most stylistically versatile. Steve Kloves’ reverential adaptation (he delivered all but The Order of the Phoenix) isn’t so much the problem here, although he might have ironed out some of the clunkier exposition and cruder reveals, as it is Columbus’ inability to make hay with what’s on the page. Spielberg had also been approached (he favoured an animated movie voiced by Haley Joel Osment, but ultimately decided there was no challenge to it – a bit like Jurassic Park, then), and if there’s a movie in the director’s catalogue Philosopher’s Stone most hearkens to, it’s his overblown soundstage extravaganza and resounding turkey Hook, or the ‘berg-produced, Barry Levinson-directed Young Sherlock Holmes. 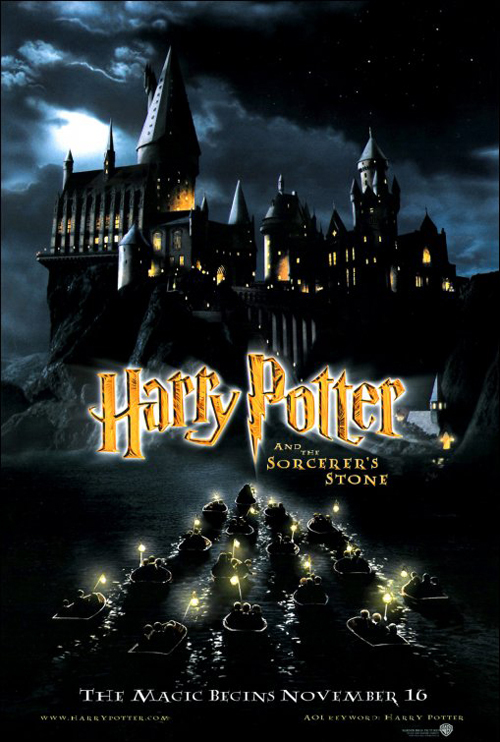 Not that Philosopher’s Stone isn’t a better movie, but it has that same – to use Columbus’ description of the picture – “golden storybook, an old-fashioned look”. Of the final four contenders, I wouldn’t have wished it on Gilliam, frankly (he’d have found being a gun for hire too frustrating, and it wouldn’t have brought out the best in him), but either Alan Parker or Brad Silberling would have been preferable to Columbus. The former had more than proved himself with a child cast (Bugsy Malone), while the latter could readily work to order and offer a bit of polish. It’s notable that two very different hero’s journey narratives arrived in 2001, both kick-starting the fantasy genre (really the only significant contenders, despite numerous attempts since by other studios to get in on the magical action). The Lord of the Ring’s Frodo Baggins was a nobody special, just a little Hobbit (although, one might stretch the point by suggesting he was the nephew of a special nobody, but it isn’t quite the same thing), while Harry followed the more favoured (currently, at least) hero through birthright, in the vein of, most significantly in the previous thirty years, Luke Skywalker, and long before that King Arthur and from thence even further back to the likes of demigods (Hercules, Perseus, Achilles) destined to be just basically damn better than everyone else. And, while the magician figure is an evergreen in mythology, both of a benevolent and dark kind, it had been more commonly the supporting, peripheral figure (Merlin, Gandalf), where here and in Star Wars there is a shift, that figure (Obi Wan, here most particularly Dumbledore) training now one who is central to become one of their kind. As such, there’s a sense of elitism – the hierarchy of the elite – infused into Harry Potter. The aspiration towards something the average person can never be. These are special people, more than mere humans (Muggles), who live apart and above the rest of us. They are the nobility – they go to public school, wear robes and are taught a life of privilege. There’s no question that they are better than the rest, because they are born to be better. To rub that in, the main Muggles we come into contact with are Harry’s cruel relatives, who lock him under the stairs, in Roald Dahl-ian fashion, and treat him like a second-class citizen (the petty revenge of serfs who know they’re beneath their lords, see); the common folk can summon only spitefulness and envy in the face of landed status. Perhaps they’re actually right to resent Harry’s genetic superiority; he is, after all, one of the master race, those deigned to secretly preserve the truth from the ordinary, ignorant masses. He doesn’t even have to try; in this fantasy, destiny – or Robbie Coltrane – will come to you. Even if, rather (Harry) pottily, your relatives flee to an island in the middle of the sea to isolate you (I particularly wondered about this wacko development, because you’d rather expect the depiction of the “real” world to be intentionally mundane – à la Time Bandits, another story with a nobody special lead, common to Gilliam’s narratives – so as to contrast the magical other that awaits). It shouldn’t be a surprise that Columbus lends the proceedings a broad, sketchy feel, as he did the same with New York in the Home Alones. Train stations are all classic steam and wizards all pointy hats. 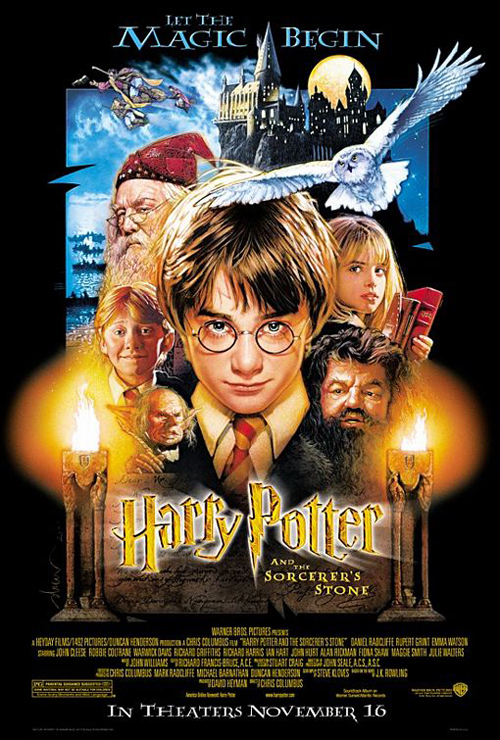 The result is that Philosopher’s Stone is presented as something of a fait accompli; like Harry and his destiny, the director knows he has a ready audience so doesn’t need to exert himself beyond sorting the art departments, costume and set design, all of whom are doing the most obvious, expected thing. Much the same happens with the cast and plot, the latter unfolding in a formal, stolid manner, invariably inching forward through lining up a series of Brit thesp stalwarts to coax the fledgling leads through their scenes. If the youngsters aren’t quite bad, only Rupert Grint could be suggested to possess the disposition of one approaching “a natural” (arguably, Daniel Radcliffe still doesn’t look like he’ll ever get there). Tom Felton shows the discernible makings of a supremely hissable little snot as Draco Malfoy, so must be doing something right. The movie suffers most when the main trio are in frame, unsupported by their peers, but only a few of these seasoned boards treaders get a chance to do more than a walk on (as far as I’ve been able to discern, Maggie Smith spends the entire franchise doing only that). Richard Griffiths brings the suitably obnoxious as Harry’s uncle, while Richard Harris makes a supremely benign and loveable Dumbedore in a way Michael Gambon just doesn’t have in him. It’s Alan Rickman who really delivers as Severus Snape, though. There were times when the actor’s manner didn’t quite fit with material or tone, but in the Potter-verse, his intonation creates a refreshing rhythm, such that the personality-free Columbus is required to keep Snape’s pace whenever he’s on screen. 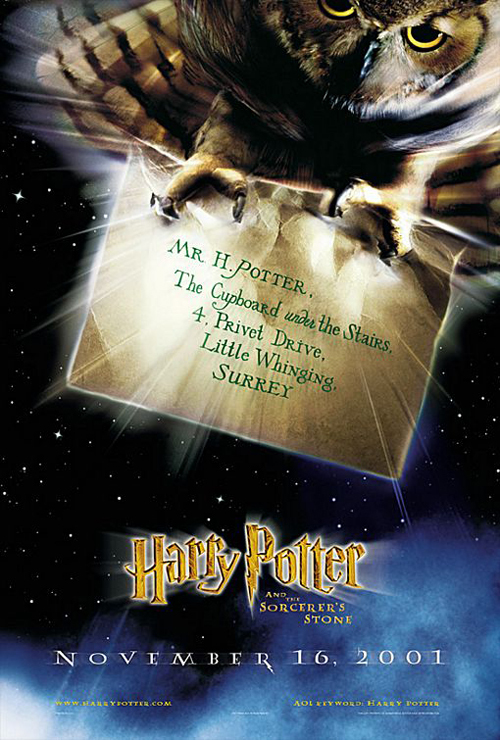 Indeed, the best part of the quidditch match – cited by many reviews as the highlight of the movie, much as the podrace was in The Phantom Menace, but looking altogether unremarkable in the cold light of fifteen-odd years, not to mention its rules being about as comprehensible as Rollerball’s – isn’t so much Harry’s gamesboyship as the misdirection of Snape’s incantations. The actual perpetrator is a disappointment. Ian Hart isn’t really suited to this kind of fare – David Thewlis, who auditioned, would have been better – and he’s entirely defeated by the reams of exposition required when Professor Quirrell is unmasked. Of which, for such an expensive movie, the special effects are often pretty ropey (and looked it then, so this isn’t revisionism). There’s an all-CGI centaur, an all-CGI troll, and an all-CGI Cerberus-esque three-headed dog named Fluffy, none of them inviting the suspension of disbelief. The reveal of Voldermort’s head on the back of Quirrell’s is a chilling idea, but slightly laughable as rendered (although, the scene in the woods, with Voldermort feeding on a unicorn is one of the few appreciably moody incidents in the picture, mustering a sense of what might have been). The lost-in-translation problem here tends to result from being too beholden to the source material and so coming a cropper as a result. The obstacles on the way to finding the Philosopher’s Stone don’t really pass muster, especially the chess game (Ron’s “self-sacrifice” is particularly weak), an awkward Indiana Jones-by-way-of-Enid Blyton recipe. There’s attention paid to characters no one could possibly appreciate unless one had read the novels – Neville Longbottom, whose significance still escapes me despite his cropping up in all eight movies – and a lack of attention to those who really ought to have been significantly more significant but appear to be referenced as an afterthought; Nicholas Flamel, whose secret is, after all, in the title of the movie, is dealt with in an entirely perfunctory and offhand manner. We’re told he has agreed for the Stone be destroyed and that he’s comfortable dying, which smacks rather of admitting defeat and represents the worst kind off-screen “and by the way, kids” wrapping up of loose threads. Particularly since there’s rich material in such immortal suspects, be it Saint Germain or Arnold of Tully in The Box of Delights. The picture generally offers a rather anaemic approach to its occult elements, offering plenty of signifiers but translating more as Bednobs and Broomsticks than anything with potent overtones or undertones. 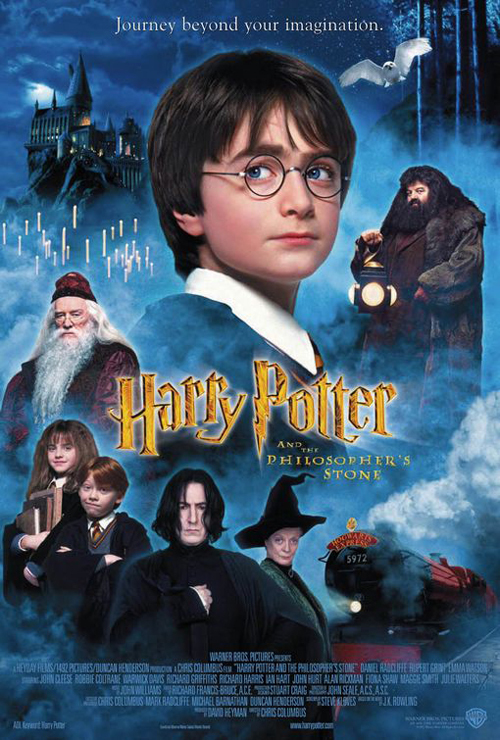 Where Harry Potter and the Philosopher’s Stone undoubtedly scores, though, is with John Williams’ theme. Come the 2000s, the composer was mostly limiting himself to work for his old pals Lucas and Spielberg, and I think it’s fair to say his best days were behind him (he could yet pull something special out of a well-worn hat), but this represents an instantly recognisable, iconic score. It does much of the heavy lifting that Columbus simply can’t to infuse Philosopher’s Stone with atmosphere. I’ve already noted that there’d be numerous young adult and fantasy pictures stuttering into various states of existence in Harry Potter’s successful wake. The irony is, as average as many of them were, they were still superior to the first couple of Potters.